Taste test: These are decent kettle chips, but nothing spectacular. 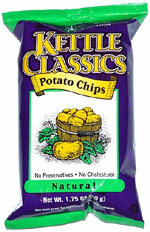 Kettle Classics' various flavored chips were more impressive than these unflavored ones. The major negative was that there were barely any chips in the bag. Kettle Classics potato chips bags seem to be on average two-thirds or more empty. Smell test: Oily kettle chips smell.